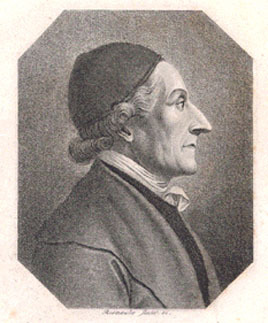 German poet and physiognomist, was born at Zürich on the 15th of November 1741. He was educated at the gymnasium of his native town, where Johann Jakob Bodmer and J. J. Breitinger were among his teachers. When barely twenty-one he greatly distinguished himself by denouncing, in conjunction with his friend, the painter H. Fuseli, an iniquitous magistrate, who was compelled to make restitution of his ill-gotten gains. In 1769 Lavater took orders, and officiated until his death as deacon or pastor in various churches in his native city. His oratorical fervor and genuine depth of conviction gave him great personal influence; he was extensively consulted as a casuist, and was welcomed with demonstrative enthusiasm in his numerous journeys through Germany. His mystical writings were also widely popular. Scarcely a trace of this influence has remained, and Lavater's name would be forgotten but for his work on physiognomy, Physiognomische Fragmente zur Beförderung der Menschenkenntnis und Menschenliebe (1775-78). The fame even of this book, which found enthusiastic admirers in France and England, as well as in Germany, rests to a great extent upon the handsome style of publication and the accompanying illustrations. It left, however, the study of physiognomy, as desultory and unscientific as it found it. As a poet, Lavater published Christliche Lieder (1776-80) and two epics, Jesus Messias (1780) and Joseph von Arimathia (1794), in the style of Friedrich Gottlieb Klopstock. More important and characteristic of the religious temperament of Lavater's age are his introspective Aussichten in die Ewigkeit (4 vols. 1768-78); Geheimes Tagebuch von einem Beobachter seiner selbst (2 vols., 1772-73) and Pontius Pilatus, oder der Mensch in allen Gestalten (4 vols., 1782-85). From 1774 on, Goethe was intimately acquainted with Lavater, but at a later period he became estranged from him, somewhat abruptly accusing him of superstition and hypocrisy. Lavater had a mystic's indifference to historical Christianity, and, although esteemed by himself and others a champion of orthodoxy, was in fact only an antagonist of rationalism. During the later years of his life his influence waned, and he incurred ridicule by some exhibitions of vanity. He redeemed himself by his patriotic conduct during the French occupation of Switzerland, which brought about his tragical death. On the taking of Zürich by the French in 1799, Lavater, while endeavoring to appease the soldiery, was shot through the body by an infuriated grenadier; he died after long sufferings borne with great fortitude, on the 2nd of January 1801.